Readers of twitter will be aware that I went to Rome last Friday, coming back Monday afternoon. I booked only a couple of weeks earlier, so I had to pay a large sum to the airline. But the hotel was cheap, relatively. Even so, the money seemed to vanish! Going to Rome in August was a bit different. The traffic is much reduced. But the sun was truly brutal. It was 32C in the shade every day – although on Sunday night there was rain and a thunderstorm – which made it impossible to do much outdoors. Sites close, also. I walked to the Trevi fountain on my first evening there, only to find it drained and empty. I had hoped to go and see the Mithraeum of Santa Prisca, which is open at 4pm on the 4th Sunday of the month; but it was closed because it is August. I stayed at the Hotel Nerva, which is behind the ruins of the temple of Mars Ultor, and right on the imperial forums. I was shown to my garret – rooms in Rome always seem very small – but fortunately the aircon was on, if not as cool as I would have liked. I asked for, and got, a desktop fan as well, which helped quite a bit. The staff ordered a number of items for me in advance, and also, at my request, asked for the ticket for Santa Prisca. This is useful if you don’t speak Italian. They ordered me a “Roma” pass which gave me free use of the underground (trains also airconditioned; stations not), as well as the train to Ostia. Interestingly I found that you can buy this pass in the arrivals hall at Ciampino, while waiting for your luggage. They also got me a ticket for the Vatican museums for 10:30 on Monday, although I could have bought this online and printed it off myself. On Saturday I spent most of the morning at the Museo Nazionale in the Baths of Diocletian, opposite Termini railway station. It was air-conditioned, it had toilets – although not toilet seats, curiously -, a vending machine for bottled water and sweeties, and … practically no visitors. This made it ideal for photographing some of the exhibits. It was also very interesting to find that some exhibits which had been absent last year had returned, and vice versa. 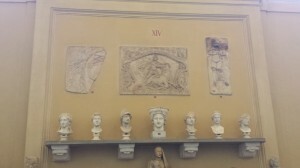 I took quite a collection of photos of the Mithras exhibits using the 10mp camera on my mobile phone. I’ve not yet done more than copy the photos to my hard disk, however. For lunch I ventured out to one of the tourist bar-restaurants nearby, and was duly scalped for poor quality food. Avoid “steak” – I have twice been offered some mass of stringy fat with bits of meat interspersed in it. 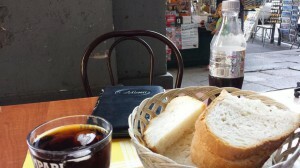 The bread was nice, but the waiter whisked it away before I could eat much of it! After that, I headed downtown. 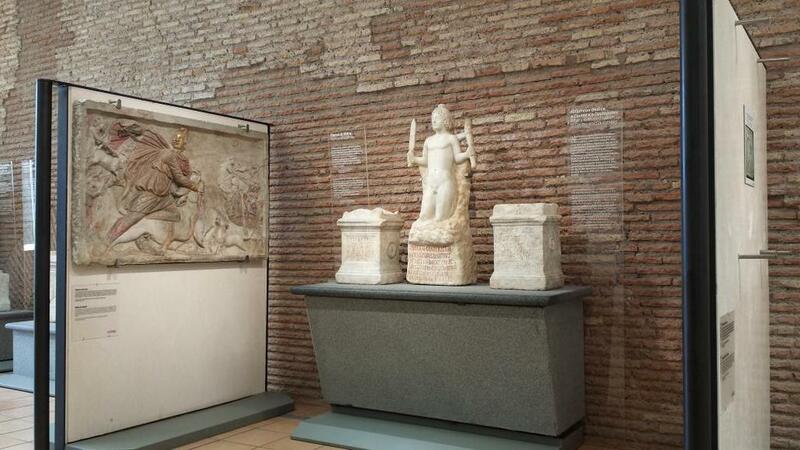 For I had discovered that my 11 euro ticket for the museum would also admit me to the museum site at the Crypta Balbi, where I knew that there was a Mithraeum. This too was largely empty, and I was able to get myself onto an Italian-speaking tour of the basement areas, including the Mithraeum – rather disappointing, the latter. The staff were very helpful. But I must say that the printed materials were profoundly confusing, and it took quite some effort to get oriented! 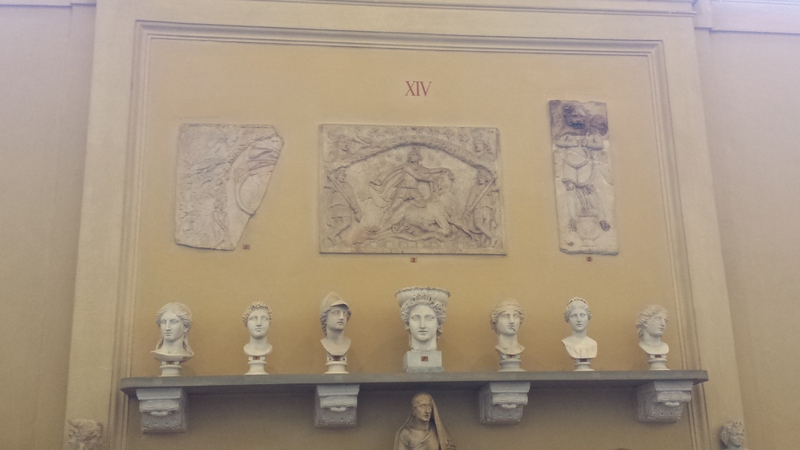 Upstairs there were Mithraic artefacts! 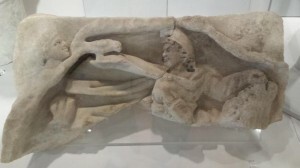 Remains of a tauroctony in the museum of the Crypta Balbi. Then I walked up to the Pantheon, and then back to the hotel to snooze for a very necessary hour. Then in the evening I went out, bought a panini at a food shop, and then I sat in the shade next to the Colosseum, and watched the people go to and fro, until the sun went down. On Sunday I used my Roma pass and took the tube to Pyramide, transferring from there to the train for Ostia Antica (also free). I have never seen a sign indicating which train is for Ostia Antica; but if you look inside, the tube-train-like panels above the doors indicate the stations to be visited. The train was airconditioned, which was nice. On arrival at the station, I walked to the ruins, and became aware how hot it was. It seemed an interminable walk from the ticket office to the cafeteria, which – and I recommend doing this – I visited first. It was empty, but I got some food, bought and drank more water, bought a 2 euro site plan in the bookshop, and then I looked to see where the Mithraea were. Then I ventured out to see if I could find a particular site. It was bestially hot, and I quickly became aware that it was no fun at all. I was unable to locate the Mithraeum, and I realised that all I wanted to do was go back to Rome. So I did, getting back around noon. It was very good to get back to my nice cool room! Far too hot in Ostia. But the room had not been made up! So I ventured out, and ended up wandering up the backstreets, eventually emerging at Termini. There is a large Spar supermarket on the far side of the station, which is worth being aware of. Then back, and, after lying around a lot, out back to the Colosseum. It was rather threatening with rain. I walked down to where the Septizonium used to be, but couldn’t see much sign of it. Then back. I bought an umbrella from a street vendor, and sat near the Colosseum. Then it rained! Up went my umbrella, while everyone else ran for cover, except for a woman sitting not that far from me who got progressively drenched. For some reason she didn’t have, or buy, an umbrella. I felt a little sorry for her; but not enough to forgo my own umbrella! Eventually I spoke to her, and she turned out to be a sports journalist from Plymouth. On the Monday I went to the Vatican museum. The pre-booked ticket meant that I could go through the entrance immediately without queuing; but the desks inside to exchange it for a ticket were a disaster. I emerged feeling very stressed. I went first to the Pio Christiano gallery, and found the statue of Hippolytus there. Fortunately this gallery was empty, and indeed was closed later. The bad news was that the statue was just a cast. Then to the cafeteria! Then I went in search of the Mithras monuments, which were in the “room of the animals”, but impossible to see from more than a distance. There were also some monuments in the Chiaramonti gallery. But on the whole the experience was awful – a great, sweaty crush of people in corridors too small for them, and no way out. I felt quite claustrophobic at one point, and eventually ducked under a rope and escaped!! After that, I went back to the hotel, and got a car to the airport. I arrived 2 hours before hand, and it took an hour to get through baggage checkin and security. After sitting on a chair for half an hour, I went through and they were just boarding the priority passengers. So I had no real time to wait. I don’t think that I would go to Rome in August again. It is just too hot to stand in the sun. But it was very interesting to see, all the same. UPDATE: The Mithras tauroctonies in the Chiaramonti gallery are these. Unfortunately none of my photos came out well. Well, on the bright side, you did get plenty of period flavor…. I’ve heard people say that it’s great to go in October or November, except that it can get pretty cold. And I imagine that with the Tiber around, cold means windy and damp. Yes, it was great to go, although exhausting as all foreign trips are. Looking forward to the weekend! I think that you can get cold and rainy weather in Rome at most times of year, and must just live with it. It was interesting to read your report of your Rome trip. 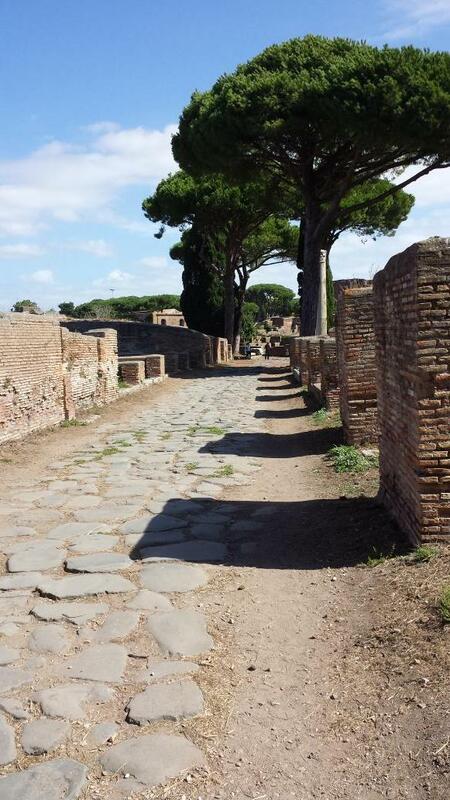 Rome in August does not sound good; I have been twice in July and that was hot enough, especially when visiting Ostia. Personally I would recommend April as a good time if you plan to see Ostia as you have the added bonus of the wild flowers. I would definitely not recommend a trip to Rome in Oct/Nov as it can be wet, chilly and miserable! Sorry to hear that you had no luck in getting to the S Prisca mithraeum. That is still on my wish list. 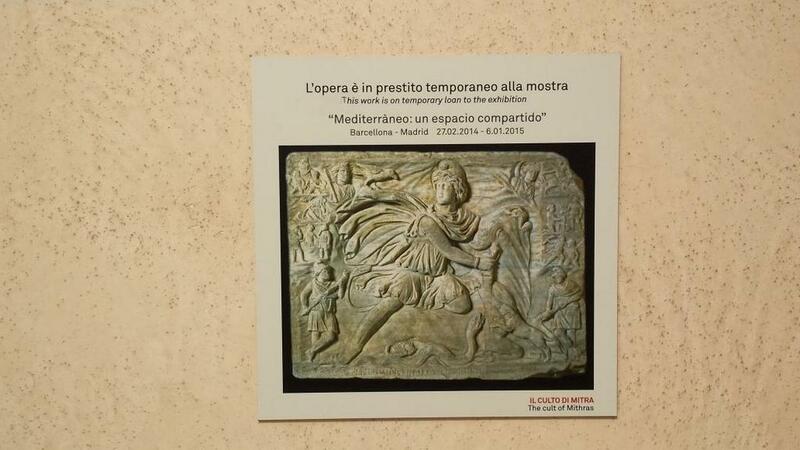 Will add a visit to the Museo Nazionale on my next trip to see the Mithras-related items you have shown. They look interesting, especially the rock birth. Also will try to get to the Crypta Balba, even if it is a bit disappointing. Not sure exactly where that is – is it fairly close to the Largo Argentina? My friends and I had similar problems to yours in the Vatican. It is only when we got to swap our e-tickets that we found lots of the museums within the Vatican were shut. We managed to see the tauroctony in the Room of the Animals too, but from a distance. I think the Vatican is increasingly geared to those visitors who just want to see the Sistine chapel. We did find a couple of rather good tauroctonies in an open courtyard in the Vatican. They were in the same area as the statue of Apollo Belvedere, but outside and set in the walls, if I remember rightly. One had a very good depiction of the mythical cave. Maybe these were the ones you found. Like you, I have spent many frustrating hours looking for mithraea in Ostia. This year I spent over six hours looking for the Seven Gates one and that was assisted by a useful friend and two maps ! We did find the Animali one, which was a new one for us, but not in very good shape. In the end we gave up but hope to return another time for another try! How very interesting! Thank you for commenting. I suspect July was not far short of August. April can be rainy, I know. It’s sun that one wants, rather than heat. The Museo Naz. items are rather splendid, I have to say. They’re up on the 2nd floor; if you go through the ticket office to the corridor, turn right towards the cloister, take the first right, and then up the stairs to the right, you will come out more or less next to them. The Crypta Balbi is indeed close to the Largo Argentina. The entrance is in the Via delle botteghe oscura. 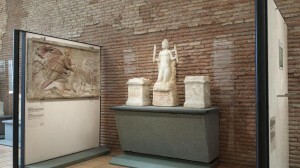 There are Mithraic monuments in the museum upstairs. But the thing to do is to get onto a tour of the archaeological area (because they won’t let you there by yourself). The Mithraeum is behind the exedra, through the first room onto the street, and then to the right, at the end, room on the left. It is not, of course, labelled, and I had difficulty recognising any Mithraic features. Tauroctonies in an open courtyard? Those I did not see. Mine were across the great courtyard with the bronze pine-cone (which used to stand on the fountain in the atrium in front of Old St Peters), in the Chiaramonti gallery. I don’t think I can add an image to this comment, but will try to add one to the post at the bottom. Are these yours? I’m not sure where the Apollo is. Ostia is hopeless. The maps sold on site are no good, even as a guide to how to get to the cafeteria! I’ve only seen the Baths of Mithras, and that in 2013. A good map would be invaluable! 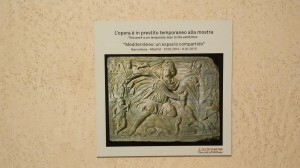 Thank you for the info about the Crypta Balbi and how to find the Mithraic items. Definitely a must for my next visit to Rome – hopefully next year. I have managed to find a couple of photos of the tauroctonies in the Vatican courtyard but not sure how to load them to this site. I have copied them but for some reason they won’t paste. If you would like to see them would be grateful for advice on this! As regards Ostia- I expect you are familiar with the book by Russell Meiggs called “Ostia”? That has a rather complex map at the back which sets out each Regio and the Insulae. There is also a simpler map of all kinds of temples on page 382 but establishing which is which is very laborious. So far my friend and I have managed to see Menandro, Terme, Seven Spheres, Dipintis, Planta Pedis, Animali (this year for the first time), Serpenti and Felicissimus, but this has been a work in progress since 2011 and some are impossible to find. I hope you have better luck than us next time you go back there! Yes, I’d love to see the photos. Is there anywhere online you could put them? You could always create a Flickr account? The Meiggs book is new to me; thank you. I find a copy for sale on Amazon here, but at a serious price! Indeed I know little about Ostia, despite having gone there twice. But I will look out for it in future! I am envious that you managed to see so many Mithraea!! I tried to find the one behind the School of Trajan, but couldn’t, despite some floundering in the weeds. Are you photographing them as you go? Apologies for not managing to send the photos. I have made several attempts and each time they were returned with a comment “recipient address rejected”. I shall try to set up a flickr account in the next few days as that might be the best way forward. I think you might find them interesting and they are definitely different from the one you posted. I was lucky to find the Meiggs book though a charity so it wasn’t too dear – certainly not the prices you were being quoted. I hope you manage to find one at a better price. Yes – I am trying to photograph mithraea wherever I find them. But they are rather elusive! The first one that caught my interest was the one at S Clemente in Rome and I have been trying to discover them ever since. Fortunately I have a retired friend who shares my interest in them so we try to find a new one each time we go to Rome or Ostia. Last year we were fortunate to find a leaflet called Roma Segreta and their excursions included one to the Mitreo dell’Ara Massima Di Ercole which is very close to the church of S Maria in Cosmedin. It isn’t normally open as it is right underneath an old factory. If you get the chance to see it, it is a “proper” underground one. Not suitable for people with claustrophobia! I’ll look forward to seeing them! Good idea to take these photos!